I hope everyone had a great (and delicious) Fourth of July this year. We spent our holiday weekend at the Ranch like we've done nearly every year since Ryan and I met over 10 years ago. It's one of our favorite places in the world, where we always feel like family and leave with full bellies and full hearts. I loved being able to share this place with Mac this year and he loved the people, the bison, the fishing, the golf carts and the lake. I have TONS of photos to come, so stay tuned (although it may be months before I get through them all!). Of course we ate very well while we were there...and by well, I mean a lot. I think I gained at least six pounds from Friday to Sunday. 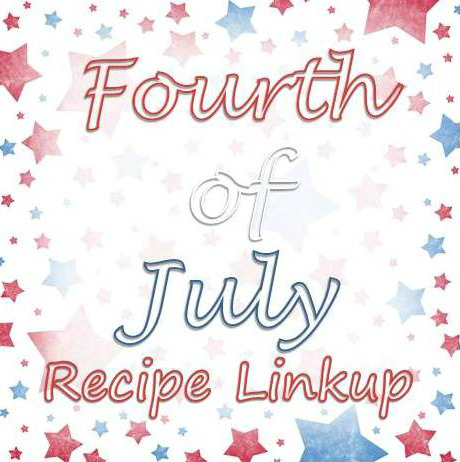 So, when we got home and it was time for me to make the recipe I'd been matched with from the Fourth of July Recipe Linkup, I was thrilled that it was so light and healthy and easy! This recipe is from Elise at Cheers Y'all and as soon as I saw it I was overjoyed to get this one. I knew right away that Mac and I would both love it. This recipe couldn't be simpler and I struggled with how to "make it my own" as our linkup instructions required. I chose to modify Elise's original recipe only slightly, by using fresh fruit (instead of frozen), Greek yogurt (instead of normal) and adding a bit of honey and vanilla, for extra sweetness and flavor. I love Greek yogurt, but it can be a bit bitter, so the honey was a nice touch to give it a bit of natural sweetness. I also added an extra couple drops of vanilla bean puree to make it extra vanillay (not a word, I know). And since it's the middle of the summer and berry season, I used fresh fruit. I think it turned out FABULOUS! 1. Mix the honey and vanilla into the yogurt in a large bowl. 2. Spread the yogurt out onto a baking sheet using a rubber spatula. 3. 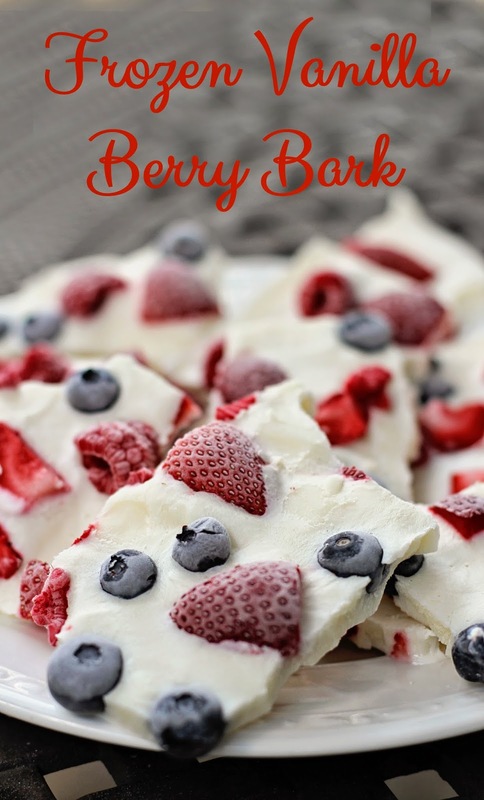 Place berries on top. 4. Freeze (at least 1-2 hours). 5. Use a knife to break into pieces. 6. Enjoy right away while it's COLD! Absolutely delish! Cold and healthy and easy peasy! Thanks so much to Alyssa for organizing the recipe swap and for Elise for your awesome recipe! I have a feeling we will be making this (and all kinds of variations thereof) a lot this summer! Check out this post to see all the recipes and matches. That turned out so beautiful! I want to make it asap! Looks amazing! And healthy! Totally making this for dessert asap - thanks! Looks absolutely amazing, can you send me some? Yum, love this!!! Glad you guys had a good one!! Definitely trying this. It is so many of our favorite things! i only had to read the title for my mouth to water with excitement! this looks AMAZING! What a genius idea! I would never think to freeze actual yogurt (I mean logically, how did I think they got frozen yogurt? lol) but this looks delicious! Thank you for sharing valuable information. Nice post. I enjoyed reading this post. The whole blog is very nice found some good stuff and good information here Thanks..Also visit my page. Christmas Hampers Fruit hampers fruit gift baskets online from Fruitcorp Fruit Hampers. Gifts for all Occasions. YUM! This looks like perfection. I'm so happy you posted this!! Pinned and can't wait to make! I'm sooo behind on everything - this looks absolutely amazing!! I'm so making this...very soon! looks delicious! Oh my gosh.... YUM! I've never seen a recipe like this for the summer time! Pinning now! Where do I find vanilla bean puree? Oh we are for sure giving this a try! EAsy and festive at the same time - thanks for sharing such a great idea!